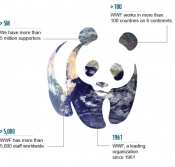 In order to achieve this mission, WWF focuses its efforts on two broad areas: Biodiversity and Footprint. The first, is to ensure that the earth's web of life - biodiversity - stays healthy and vibrant for generations to come. WWF strategically focuses on conserving critical places and critical species that are particularly important for the conservation of earth's rich biodiversity. The second is to reduce the negative impacts of human activity - ecological footprints. They are working to ensure natural resources required for life -land, water, air - are managed sustainably and equitably. Since WWF is organized with dozens of local offices, this contribution is directed toward WWF in the United States with requested earmarks toward globally relevant activities. (We encourage purchasing multiple modules if you wish to donate more Ven to the cause). 95.5% of this donation credits WWF directly, with the remaining 4.5% covering administrative and credit card purchase charges and fees. WWF is doing important work to shift policy at large, and is also a beneficiary of our Environmental Funds.